Preheat oven to 450 degrees F. Spread coarse salt evenly over shallow baking pans with an edge, such as pizza pan. Open oysters, letting oysters remain in deep half of shell; discard other half. Arrange oysters in single layer on salt. Place prosciutto strip on each oyster. Sprinkle each oyster with ¼ teaspoon pine nuts. Bake for 6 to 8 minutes until edges of oysters begin to curl. Meanwhile, combine the vinegar, white wine, olives, shallot, and basil in a small bowl. 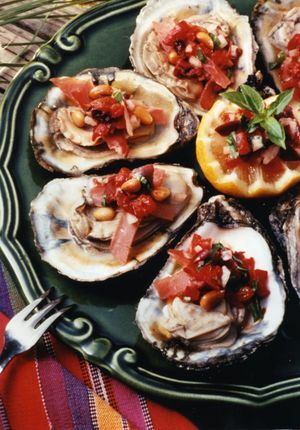 Remove oysters and serve with a spoonful of Mediterranean-style sauce. Makes 2 dozen. FINELY chop celery and onions. Sauté in margarine or butter until tender. Mix in seasonings. Add oysters with liquor and simmer until edges of oysters just begin to curl. Remove from heat and gently mix in bread cubes. Adjust moistness with water as desired. Makes about 4 cups dressing (allow about ½ cup per pound for fish; 1 cup per pound for poultry). Note: For an extra special tangy taste, core and finely chop 2 medium apples and add with celery and onions when cooking. Yield will increase about ½ cup. Cooks Note: To measure the amount of oil needed to fry the turkey, place turkey in fryer, add water to top of turkey, remove the turkey and the water line will indicate how much oil will be needed to fry your turkey. Having too much oil can cause a fire. The pot should not be more than 3/4 full or the oil could overflow when the turkey is added. Wash bird inside and out, and allow to drain. Rub turkey all over with House Seasoning. Coat turkey with dry rub. Allow the bird to sit until it reaches room temperature. Heat peanut oil in a turkey fryer or a very, very large stockpot to 350 degrees F. Lower turkey into hot oil, very carefully, making sure it is fully submerged. Fry turkey for 3 minutes per pound plus 5 minutes per bird. Remove turkey from oil and drain on paper towels. 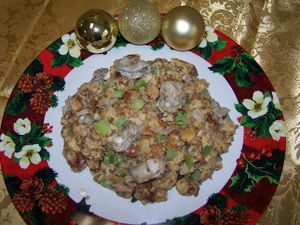 Use stuffing as a complement to the deep-fried turkey above, or any turkey prepared to your liking. Begin by cooking the celery, red pepper, and onion in the butter until tender. Stir in the oysters and cook an additional two minutes. Place the stuffing mix into a large bowl and gradually stir in the oyster mixture and thyme. Sprinkle the broth onto the stuffing in order to moisten it and mix together. Place your stuffing in the appropriate sized turkey or casserole dish. Preheat your oven to 325º F. Cover and bake for 30 to 35 minutes or until heated through. Adam Gibson of Marion Station, Md. won first place in the appetizer division and grand prize in the National Hard Crab Derby Cooking Contest held in Crisfield. Twenty-five contestants in four categories competed to win the coveted title in the annual contest. His dish, Maryland Crab Imperial Nachos featured three ways to use crab in an appetizer. Crab imperial, crab salsa, and crab pico de gallo were served with warm nachos drizzled with melted pepper jack cheese. First place in the main dish category was Madeline Hall of Salisbury for her Basil Pesto Crab on Pita Bread. Best crab cake went to Charlese Ann Smith of Bishopville for her dish, Best Back Fin Crab Cakes with Corn Salsa. Kim Todd of Crisfield took home the first place honor in the soup division for her recipe, Kim’s Crab and Corn Chowder. The 45th annual National Hard Crab Derby & Fair’s Cooking Contest is sponsored by the Maryland Department of Agriculture’s Seafood & Aquaculture Program. Below is the grand prize winning recipe. Recipes by Adam Gibson, Marion Station, Md. Combine flour and butter to make a roux. Slowly add cream. Add pepper jack cheese until thick and creamy. Assemble crab imperial, salsa and pico de gallo on platter. Arrange warmed nachos around dips. Drizzle cheese sauce over and around nachos. Garnish with cilantro, lime slices, green onion, remaining crab meat and Old Bay. Combine all ingredients except crab meat. Refrigerate overnight. Slowly fold in crab meat. Combine all ingredients except crab meat. Slowly fold in crab meat. Place in a shallow baking dish and bake at 400 degrees for 15 minutes. Remove from heat. Combine all ingredients except crab meat in food processor. Refrigerate overnight. Slowly fold in crab meat. This page was last edited on 27 November 2008, at 20:32.